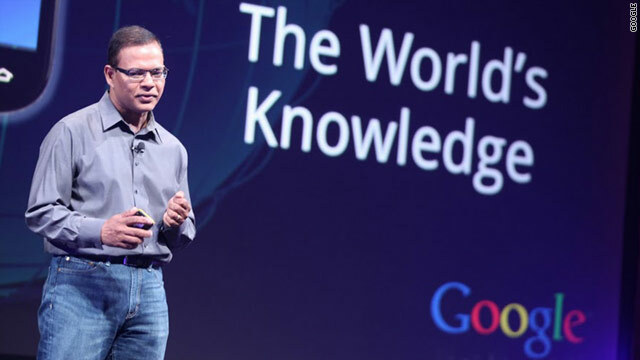 Google search guru Amit Singhal announces new search features at Tuesday's press event. San Francisco (CNN) -- The plain Google search box will soon be able to handle more than taps on a keyboard. Google is bringing features pioneered on smartphones, like voice and image search, to its flagship product, the company said at a news conference here on Tuesday. The speech-recognition tool began showing up as a microphone button on the right-hand side of the Google.com search box for some visitors on Tuesday. It will only be available on Google's Chrome Web browser for now, but Google executives say they hope other software makers implement the technology to support the feature. Like on Android or the Google application for the iPhone, people can click the mic icon on Google.com, and say a phrase or question into their computer microphone. The speech technology attempts to account for accents and context in order to transcribe the recording into text. This produced mixed results in my testing, speaking in plain English or with a faux Cockney accent. The image-search feature will start rolling out in the next few days, said Johanna Wright, a Google search director. "Every picture has a story, and we want to help you discover that story," she said. Image Search can, say, look at a family vacation photo and figure out where it was shot, or help explain images that become Internet memes, such as Lolcats. The recognition technology applies a bunch of Google's proprietary algorithms to photos, but facial recognition isn't one of them, executives said in an interview with reporters. People using newer Web browsers will be able to drag an image file from the desktop onto the search box. Additional features are available to those who install the Google Toolbar in Firefox. Google Instant, the immediate suggestions offered when a user is typing into the search box, will debut on Google's image-search section "in the coming weeks," said Google exec Amit Singhal. To complement Google's quest for high-speed Web surfing, the company plans to roll out a feature called Instant Pages. It will sometimes load the top search result on your computer before you click on the link, so that the page pops up instantly once you do. The feature will only be available in Chrome, starting with the beta version of the software later this week. That many of Tuesday's announcements will initially only be available in Chrome limits their reach. In May, Google controlled 65.5% of the U.S. Web search market, according to comScore, but Chrome only had 12.5% of browser usage -- far behind Internet Explorer and Firefox -- said research firm Net Applications.